You can really taste the difference between a Livit and a diet here, because despite cocoa�s association with candy, it really is good for you! Cocoa may help control blood pressure, reduce insulin resistance, and provide other Benefits to cardiovascular health. The trick to getting the Benefits is to limit the fats and sugar associated with chocolate. Stick to cocoa powder, which lacks the cocoa butter but contains all that good chocolate taste. One tablespoon of unsweetened cocoa provides 20 calories, 3 g carbohydrate, 1 g protein, 0.5 g fat, 1 g dietary fiber, 4 IU vitamin A, 202 mg potassium, 97 mg calcium, 89 mg phosphorus, 25 mg magnesium, and 0.35 mg iron. Anyone who has eaten a fresh cranberry knows that these native North American fruits have a unique taste. They also have some unique nutritional benefits. Cranberry procyanidins appear to inhibit the stickiness of bacteria, giving the tart red fruit�and its more popular juice�the ability to help prevent urinary tract infections. That same anti-adhesion property gives cranberries a role in preventing tooth decay, and possibly even the bacterial infection implicated in many stomach ulcers. Cranberries have one of the highest ORAC levels among the 277 foods tested by the USDA. They also provide vitamin C.
Cranberries are relatively low in sugar and carbohydrate�another thing anyone who has tasted them fresh might have guessed. That means that cranberries and cranberry juice can bring the Benefits of fruit to those who must limit carbohydrate and sugar. One cup of whole raw cranberries provides 47 calories, 12 g carbohydrate, 0.4 g protein, 0.2 g fat, 4 g dietary fiber, 44 IU vitamin A, 13 mg vitamin C, 2 mcg folic acid, 67 mg potassium, 7 mg calcium, 9 mg phosphorus, 5 mg magnesium, 0.19 mg iron, 0.12 mg zinc, and 0.15 mg manganese. Cranberry procyanidins appear to inhibit the stickiness of bacteria. This antiadhesion property helps in the prevention of infections such as those implicated in stomach ulcers and the urinary tract. It also gives cranberries a role in preventing tooth decay. Cranberries provide vitamin C and have one of the highest ORAC levels among the 277 foods tested by the USDA. Carbohydrates: Fruits 21 Dried cranberries provide many of the same Benefits as fresh ones, and at least one study suggests they could even be as effective as cranberry juice in preventing urinary tract infections! One-third cup of sweetened dried cranberries provides 120 calories, 29 g carbohydrate, 0.03 g protein, 0.5 g fat, and 2 g dietary fiber. Archaeologists have found evidence that date palm trees were being cultivated in eastern Arabia as long as 8,000 years ago. Such a long agricultural history has allowed many varieties of dates to be developed, in three main types: soft, semi-dry, and dry. All three types are relatively low in water content. However, dates that have been allowed to ripen and dry on the tree lose most of the vitamin C that is present in fresh dates that are harvested before drying. Although dates are grown throughout the Middle East and are a major export of Iraq, they are also grown in California and Arizona�primarily the medjool, which is a soft date, and the deglet noor, a semi-dry. Dates are very sweet, with one 24-gram medjool date providing 66 calories and almost 16 grams of sugar. The smaller deglet noor, at 7 grams, is still more than half sugar by weight. A 2008 summary of research on dates showed that they are a significant source of ten minerals, including selenium, copper, potassium, and magnesium�and that 100 grams of dates would provide over 15 percent of the recommended daily allowance for them. The review also found that dates are a good source of antioxidants, primarily carotenoids and phenolics. In addition to the four minerals listed above, dates contain boron, calcium, cobalt, fluoride, iron, phosphorus, sodium, and zinc, as well as 23 types of amino acids, which is unusual for a fruit. Unfortunately, many of the dates� proteins are in the seeds, not the flesh, so it may take new and creative uses of the seeds for dates to realize their role as an ideal food. Five dried dates with pits removed provide 114 calories, 30 g carbohydrate, 1 g protein, 0 g fat, 3 g dietary fiber, 21 IU vitamin A, 0.9 mg niacin, 5 mcg folic acid, 1 mg sodium, 270 mg potassium, 13 mg calcium, 16 mg phosphorus, and 14 mg magnesium. Figs have been part of the human diet for at least 10,000 years and are now grown throughout the Mediterranean, as well as in California, Oregon, Texas, and Washington State. Figs are a good source of fiber and are high in protein, for a fruit. They are also among the best plant sources of calcium. A fig supplies 16 percent of the recommended daily intake for iron, 18 percent for magnesium, and 14 percent for potassium, which Benefits your heart and other organs by keeping your blood pressure and hydration in balance. Fig leaves have been found to have some potential in controlling diabetes. (raw fig) One medium raw fig provides 37 calories, 9.6 g carbohydrate, 0.38 g protein, 0.15 g fat, 1.6 g dietary fiber, 71 IU vitamin A, 1 mg vitamin C, 3 mcg folic acid, 116 mg potassium, 18 mg calcium, 9 mg magnesium, 7 mg phosphorus, and 0.18 mg iron. (dried fig) One dried fig provides 21 calories, 5.47 g carbohydrate, 0.28 g protein, 0.08 g fat, and 0.8 g dietary fiber. It may surprise many people, but grapefruit really can help with weight loss! In a small test involving 100 obese people, those who ate half a fresh grapefruit each day lost more weight than the control group that did not. It appears that the effect is partly due to grapefruit�s ability to lower glucose levels. Eating grapefruit also appeared to help patients with metabolic syndrome, reducing their insulin resistance. Although these studies were small and more research needs to be done to determine why and how grapefruit works, the results could be significant for the treatment and prevention of type 2 diabetes. Grapefruit is rich in flavonoids that are helpful in lowering the risk of cancer and cardiovascular disease. It is a good source of pectin (a soluble fiber that helps lower cholesterol) and vitamin C. Because it is not very sweet, it is a good fruit for those who wish to limit carbohydrate. Grapefruit seeds have also been shown to have an antibacterial effect. As is often the case, the more brightly colored fruit tends to have more antioxidants and other life-saving compounds. That means that pink- and red-fleshed varieties of grapefruit pack more nutrient punch than white grapefruit, including the antioxidant lycopene, which may help prevent age-related blindness. One-half medium pink or red grapefruit provides 39 calories, 9.9 g carbohydrate, 0.8 g protein, 0.1 g fat, 1.4 g dietary fiber, 153 IU vitamin A, 42 mg vitamin C, 13 mcg folic acid, 171 mg potassium, 15 mg calcium, 10 mg phosphorus, and 10 mg magnesium. Grapes and their juice are a source of resveratrol, a polyphenol antioxidant that is thought to be one of the health-promoting elements in red wine. Resveratrol appears to be involved in reducing the risk or slowing the development of cancer, heart disease, degenerative nerve disease, viral infections, and Alzheimer�s disease. It also shows potential in treating bronchial asthma and helping to prevent type 2 diabetes. 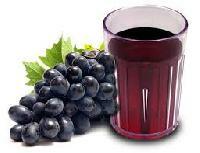 Resveratrol is most highly concentrated in the skin of grapes. Grapes also contain antioxidant anthocyanins and catechins, and some varieties also provide ellagic acid, myricetin, quercetin, kaempferol, and other phytochemicals and phenolics. They are a moderately good source of vitamin C and potassium, and they contain small amounts of a wide variety of minerals. One cup of raw grapes provides 58 calories, 15.8 g carbohydrate, 0.6 g protein, 0.3 g fat, 0.9 g dietary fiber, 92 IU vitamin A, 4 mg vitamin C, 4 mcg folic acid, 2 mg sodium, 176 mg potassium, 13 mg calcium, 9 mg phosphorus, and 5 mg magnesium. Grape juice is a significant source of resveratrol, a polyphenol antioxidant that is thought to be one of the health-promoting elements in red wine. Resveratrol appears to be involved in reducing the risk or slowing the development of cancer, heart disease, degenerative nerve disease, viral infections, and Alzheimer�s disease. It also shows potential in treating bronchial asthma and helping prevent type 2 diabetes. Resveratrol is most highly concentrated in grape skins, which is why red wine has greater potential health Benefits than white wine, for which the grape skins are less a part of the wine-making process. Grapes and their juice also contain antioxidant anthocyanins and catechins, and some types also provide ellagic acid, myricetin, quercetin, kaempferol, and other phytochemicals and phenolics. They are a moderately good source of vitamin C and potassium, and they contain small amounts of a wide variety of minerals. One-half cup of grape juice provides 77 calories, 19 g carbohydrate, 0 g protein, 0 g fat, 0.3 g dietary fiber, 4 mg sodium, and 10 mg calcium. Honeydew melon, like cantaloupe, is a variety of muskmelon. Honeydews are in the Inodorus group, named for the sweet smell of these melons. Typically, honeydews have a pale green flesh, though some newer hybrid types have orange flesh and these may have more carotenes. Honeydews are a good of vitamin C, potassium, copper, and B vitamins (including thiamine, niacin, B6, and pantothenic acid). The water and potassium present in honeydews help maintain healthy blood pressure and hydration. One cup of cubed raw honeydew melon provides 60 calories, 15.6 g carbohydrate, 0.8 g protein, 0.2 g fat, 1 g dietary fiber, 68 IU vitamin A, 42 mg vitamin C, 10 mcg folic acid, 461 mg potassium, 17 mg sodium, 10 mg calcium, 17 mg phosphorus, and 12 mg magnesium. 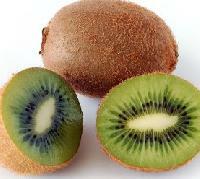 Before being popularized by New Zealand growers in the 1950s, the kiwifruit was known as the Chinese gooseberry. It is rich in potassium (with almost as much potassium as a banana) and vitamin C (with more of this vitamin than an orange). A good source of beta-carotene, vitamins A and E, the kiwifruit also provides magnesium, copper, phosphorus, carotenoids, and polyphenols. Kiwifruit may be a natural blood thinner: One study found that eating two or three kiwifruit per day had about the same effect as aspirin therapy for reducing the risk of clots and lowering the amount of fat in the blood. One medium raw kiwifruit provides 46 calories, 11.3 g carbohydrate, 0.8 g protein, 0.3 g fat, 2.6 g dietary fiber, 133 IU vitamin A, 74 mg vitamin C, 29 mcg folic acid, 252 mg potassium, 4 mg sodium, 20 mg calcium, 30 mg phosphorus, and 23 mg magnesium.